Tuning and temperament1)The title is from the book Tuning and Temperament — A historical survey (1957/2004) by J. Murray Barbour. Frank Havrøy is a Ph.D. fellow at the Academy of Music in Oslo and a member of the vocal ensemble Nordic Voices. His research focuses on, through studies of ensembles like Neue Vocalsolisten Stuttgart, the vocal ensemble musical practice and (what kind of) the competence a classical singer gains by participating in such a practice. Over the last two years I have been visiting some of the best classical vocal ensembles in the world. I have observed and interviewed them, and have heard and seen how intonation work stands central to them all, from Nordic Voices, the Norwegian vocal ensemble of which I am a member, to Neue Vocalsolisten Stuttgart, the Hilliard Ensemble, and I Fagiolini. Intonation is inevitably a crucial element for any a cappella ensemble. The question I raise here is how these internationally acclaimed ensembles deal with this challenge, and whether there are theoretical and/or practical similarities in the ways that are used to solve intonation issues. Many of these ensembles work with music that exceeds the limits of tonal centres, which is to say music of quite complex harmonic structures. Add to that the intricacy of pitch production and auditory pitch control, which I will explain, and intonation work in total seems to occupy a good deal of their rehearsing time. In this paper I will try to give an insight into how both intonation choices and intonation work influences vocal ensemble practice as well as the actual sounds produced. I will discuss how tuning, throughout history, has been has been theorized in terms of natural laws, and in the practical terms of what ensemble singers do to anchor themselves in the absence of instrumental pitch support. Singers, as I will show, tend to construct a tonal, predictable event, even within a harmonic complexity that goes beyond tonality, and that the practical solutions to intonation in contemporary music are not so very different from those of tonal music.2)I am grateful to my colleague Christina Kobb for helpful comments in the preparation of this article. The process of producing sounds with the voice is a muscular, complex task. The phonation frequency is determined by balancing the thickness and tension of the vocal chords (Sundberg 2001: 72), controlled by both the somatic (voluntary) and the autonomic (involuntary) nervous system (79). We normally control pitch aurally, although our ears can give us a false picture of the actual sound produced. When hearing your own voice, you not only hear the sound that comes out of your mouth, but you also sense the sound spreading throughout your body tissue (Brown 1996: 189). Consequently, it is very difficult for a singer to have a clear understanding of how his or her voice actually sounds, including which pitch the voice actually produces. The complexity of the muscular process, and the chance of being deceived by the ears, together make sound production and pitch control an unpredictable affair. More than just depending on their ears, good singers try to think about singing as an automatic process by attending to their inner projection of their voice, rather than focusing on every muscular impulse needed for producing the desired sound and pitch. This inner projection is largely automatic and indescribable, like the skill involved with riding a bike. The knowledge of how we ride a bike or sing a perfect pitch lies in the performance itself, a ‘knowing in action’ as Donald Schön describes it (Schön 1987: 25). You cannot just say: ‘I am singing the right note’. It is not possible. There is always a kind of a chord you have to find, and in this chord you have to find the quality of the sound, the formant quality of the voice and the right dynamics. Because the intonation choices that the vocal ensemble singer faces are quite complex, work on intonation issues is central to vocal ensemble practice, not only in terms of exact pitches, but also concerning aspects of voice technique, communication between singers and the balancing of voices. When a singer in a vocal ensemble produces a pitch he or she relates to other singers’ pitch production. Together all the singers’ notes create a chord, a chord that will carry within itself a hierarchy wherein some notes will be more important in that they serve as reference points, defining the other pitches. Traditionally, in tonal music, the singer who sings the keynote defines the other pitches to a greater extent than the singer who sings the fifth or the third. Tuning and temperament3)The title is from the book Tuning and Temperament — A historical survey (1957/2004) by J. Murray Barbour. It is a D-minor chord (1) spread across the parts, from top to bottom; soprano 1, soprano 2, alto, tenor 1, tenor 2 and bass, with the minor third (F) in the soprano 1 part. The bass then sings another F, and the chord changes to F major (2). The challenge here is to stabilize this F-major chord, because when the bass singer sings the F, he will have to sing the F that the soprano 1 has just sung two octaves higher. This F is, if the soprano 1 sings it in just intonation, higher than it would have been in an equal-tempered system. This means that the F in the chord will become quite highly intonated, and that the other notes in the chord, for instance the c1 in the tenor 1 (i.e. the fifth), will have to adjust accordingly, which of course is quite difficult to achieve in the millisecond the chord has to be in place. On one occasion, the soprano of Nordic Voices asked the bass if the F really should be that high, and the bass replied that that was the question which many wise people have asked themselves and others for centuries. Concepts of tuning systems and temperaments have been discussed by musicians and theorists for as long as there has been any music theory. Since the voice is capable of singing every frequency within its range, and the ear can differentiate between changes in frequency of up to 1/17 of a tone (Seashore 1938: 56), it gives us a vast range of frequencies to organize. It may therefore seem like a coincidence that we have ended up with twelve semitones to the octave, but this is a legacy from the equal temperament compromise that in a way solved the intonation challenges related to keyboard instruments. The number twelve is central, twelve being the number of pitches involved when stacking fifths on top of each other before reaching the initial note (seven octaves higher). The well-known problem is that if these fifths are perfect (or pure, that is having a ratio of 3:2 from the prime frequency), you end up on a note that is considerably higher than the 2:1 equivalent of the initial pitch. This gap, known as the Pythagorean comma, actually overshoots the pure octave by almost a quarter of a semitone (Duffin 2007: 25). Perhaps more than anything it shows that it is impossible to make instruments with fixed pitches without some form of compromise. Pythagoras of Samoa’s discovered (supposedly) the numerical basis of acoustics when he caused a single string to vibrate, and then played half the length of the same string, with the effect that the pitch jumped up an octave (24). On the basis of this discovery he described musical consonance in terms of ratios, octaves corresponding to a 2:1 ratio, fifths to a 3:2 ratio, and fourths to a 4:3 ratio (24). Starting from these ratios, attempts were made to define the notes of the diatonic and chromatic scales using a succession of fifths and octaves (Barbour 2004: 1), but not without some quite substantial challenges and compromises due to the implications of the Pythagorean comma. Pythagorean tuning became common during the Middle Ages, the system being well suited to colour the melodies of Gregorian chants, and even when harmony was implemented to a greater extent, the open fifths and fourths of Pythagorean tuning held their ground (3). However, thirds and sixths represented a huge problem, and were regarded as imperfect consonances for a long time (Morley 1597: 141). All present-day theory-books have been written with equal temperament in mind … These books have been written as though the present equal temperament had always existed, and the student is given little, if any, information about the older temperaments, or concerning the vital facts of the untempered or just scale … The absence of the necessary information results in much out-of-tune singing of a cappella music … One of the worst fallacies in present-day music is the endeavour to teach a cappella music with the assistance of a piano in equal temperament … The singers have been taught false intervals, but are supposed to sing pure ones, for all a cappella music must be sung in just intonation (1936: 218). This was written some ten years before the birth of the Deller Consort, one of the first vocal ensembles of the Early Music Movement. This movement also played a significant part in pushing investigations into the history of tuning and systems of temperament (Devaney and Ellis 2008: 144), leaving singers today with a couple of choices as to what tuning system to use, especially when singing together with other singers or other non-fixed pitch instruments. … a very common sign of poor training is the horrid wavering up or down in pitch … It spoils the correct singing of the others, just like an out-of-tune string disturbs the tuning of the clavichord (in MacClintock 1979: 15). Let him teach the Scholar to hit the Intonation at any Interval in the Scale perfectly and readily, and keep him strictly to this important Lesson (1747: 21). Tosi, although writing most of the time, as everyone else also did, about the solo singing voice, admits a difference between tuning to an equal tempered instrument like the organ and tuning to a non-tempered instrument like the violin (21). He also pointed out a difference between what he called a major and a minor semitone, meaning that an E flat should be sung higher than a D sharp (Duffin 2007: 51). This differentiation between a major and a minor semitone is also found in the handwriting of Mozart, who referred to a ‘mezzo tuono grande’ (major semitone) and a ‘mezzo tuono piccolo’ (minor semitone) (65). This clearly shows that even though we generally think equal temperament to have been omnipresent from the late eighteenth century, the picture is much more nuanced. But as equal temperament gradually took over, implications for intonation in vocal ensembles stepped more and more into the background of public interest. … combination of generous widthed tones, and small semitones has a smoother, more felicitous flow than two sizes of a tone and a large semitone (1037). Covey-Crump concludes that it is best to think about the intonation of any note in terms of a fusion between the just and Pythagorean systems. Many theorists have tried to answer how singers should think when tuning different kinds of music, which has usually involved them presenting their own tuning system or guideline to intonation nirvana (Bohrer 2002: 50). So often singers end up standing on the shoulders of centuries of intonation theory, and with a lot of tuning systems at hand, trying to find their way out of the challenges they meet, especially when encountering other non-tempered instruments. Singing combines pitch intentions with a complex motor system involved in producing pitch, which often makes it difficult to achieve clear results in a research setting, often resulting in deviations in pitch. Judging your own pitch is quite difficult in a performance, since the cognitive and motor load on a singer is so very high (Vurma and Ross 2006: 342). A study by Franz Loosen shows, though not with a very clear tendency, that when given the task to choose their preferred tuning system, non-tempered instrumentalists (violinists in this instance) preferred Pythagorean to equal temperament, whilst equal tempered players (pianists) tended to prefer equal temperament, and that, interestingly, non-musicians did not prefer one or the other (1995: 301). So it seems that although singers often not actually hit the intended pitches, the more experienced they are, the more aware they are of which tuning system they at any time perform within. And, within the context of a vocal ensemble, singers find themselves responsible for their place in a harmonic environment and for the tuning of their own melodic line. This could explain the juggling between just intonation and the Pythagorean system, which latter is often applied to melodic lines, whilst the former is applied to more harmonic moments in the music, giving the intonation work both a horizontal and a vertical aspect. The horizontal aspect of intonation is connected to the melodic movements in a musical work. Pitches in a melodic line relate to each other psychoacoustically because listeners (and performers) try to organize the musical idiom and its sounds into coherent structures.5)This theory was put forward by Lerdahl (2001). When listening to music, we shape sounds into meanings in accordance with our nature and experience (Larson 2003: 458). More precisely, in an act of melodic expectation, we predict what will come next in a musical process. Steve Larson argues that there are different musical forces in play within the concept of musical expectation, or melodic completion. He calls these forces gravity (the tendency of unstable notes to descend), magnetism (the tendency of an unstable note to move to the nearest stable pitch), and inertia (the tendency of a musical pattern to continue in the same fashion, where what is meant by ‘same’ depends upon what this musical pattern is ‘heard as’) (461). Similarly to Fred Lerdahl, Larson suggests that pitches in a line relate to one another, and that there is a tension grid between them that determines what frequency they are played or sung at. Although some of these theories point towards Pythagorean tuning, the effect of expressive intonation blurs the picture, meaning that the pitches produced are not only a result of musical expectations and laws of nature, but also a result of musical meaning or emotion (Devaney 2006: 521), giving the horizontal aspect of intonation a somewhat unpredictable outcome. Whilst theories of the intonation of melodic lines are often blurred and confusing, the vertical aspect of intonation seems easier to describe, especially when addressing ensembles. Writers concerned with vertical intonation seem to prefer just intonation (Bohrer 2002: 162), where ‘just’ means that the ratio of the frequencies involved can be expressed with small integers (Hagerman and Sundberg 1980: 77). Whereas the horizontal approach concentrates on melodic issues, the vertical approach concentrates on simultaneous pitches, often involving the concept of ‘consonance’. Helmholtz’ theory of consonance suggests that two tones are experienced as consonant when their partials produce a small number of beats, this ‘beating’ being produced by interference between notes of proximate frequencies (Devaney and Ellis 2008: 145). When the frequencies involved move too far apart from each other, the frequency of the beats increases, before the beat fuses into a perceived third frequency, often experienced as a ‘rough’ sound, or dissonance (Butler 1992: 56). There is of course a human factor involved as well when singers are in ‘vertical’ mode, meaning that we very seldom will experience an ensemble hitting the desired pitches every time. But in the horizontal mode of intonation the singer experience far greater freedom in pitch choices, while the vertical mode is characterized with a higher grade of being intentionally locked into the concept of consonance and just intonated pitches. The solo parts might be a bit more free, in terms of colour and even timing, because I don’t have to ‘speak’ with the five others. So, it is much more free, actually, depending on the music, if it is with vibrato or with more air. I will try to find a colour which will differ from the others, not much, but it will be different. Yes, I love it like this. I think it is not a good idea to hold the third as a reference point. So sometimes it is good to just build a chord up from low to high, but more often it is better to build it up from the ground tone, fifth, the third, and then the others, I think. Wölfli Kantata is not what we would normally think of as a tonal piece, but the singers of Neue Vocalsolisten would turn to listening for combination tones while rehearsing,6)Combination tones: two tones sounding simultaneously may give rise to the sensation of one or more additional tones (Plomp 1976). In this example the two singers of Neue Vocalsolisten sang a1 (440 MHz) and c#2 (550 MHz), giving rise to the tone A (110 MHz) when hitting the frequency purely intonated. and even try to find tonality, triads, and intervals like octaves and fifths within a complex harmony, in the search for ‘local tonalities’ within the chord structure. This model shows how that more homophonic music demands a more vertical focus, which implies just intonation. The singer pointed out how the tenor and baritone parts should relate, not so much to the other voices, but more to each other, with the c#1 as the central tone, in a horizontal way. 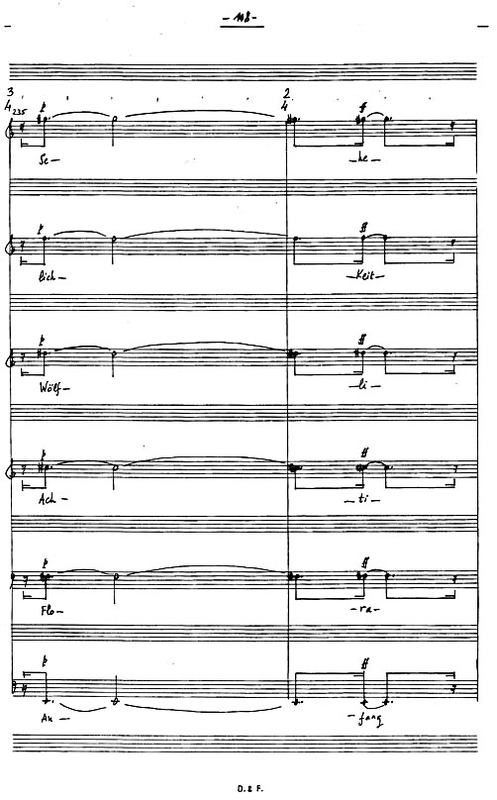 The three upper voices, on the contrary, would have to listen to each other very closely, singing clear chords in a homophonic, accompanying role. They move more or less in perfect triads, and the bass voice joins in the second bar (i.e. bar 70, as shown in Figure 3), enhancing the harmonic whole. This example shows how the vertical and horizontal focus will shift during a piece, and how a vocal ensemble singer, singing at this level, will have to be extremely aware of their particular role. When a vocal ensemble moves into a vertical focus, they usually seem to lean towards just intonation. This urge is very strong, and makes singers look for intervals like unisons, octaves, fifths, and thirds to anchor their pitch production. When they come across perfects triads, they will focus on them, even in music we would not normally associate with traditional tonality. Even in quite complicated chords wherein there is no immediate tonal centre the singers will look for tonal structures. In the example above (Figure 3), the upper three parts will understand themselves as an isolated element in the music making, focusing on the chords and intonating the pitches in a pure way, with the g1 as the tonal centre, the d2 as the fifth, and the b2 as a pure intonated third in a G-major chord. Yes, always … The more vertical you think, the better for the ensemble. We try to work in that way with intervals. We decide which intervals have the priority … We work and work on it, and listen closely until we find the right pitches, and then we try to keep it in mind. This way of finding a tonality within a complicated chord structure means that the ensemble constructs chords or tonality that the composer may not have intended. ‘… my part is ok, and I do my part perfectly and for me it is not important what the others do’. That would be the opposite of what is necessary. You should be interested in what the others do and to find that common…, that common sense. The problem with this chord is that you don’t hear all the singers well. Some you hear much better, so for us three or four high voices, I think it’s a C#-major chord with me adding the ninth. So, I totally lean on the fourth to the soprano and try to have this very nice structure of the high G#, the F and the C# of the tenor as a basement. There are of course other solutions to the intonation mysteries of this chord. For instance, the soprano could intonate her g#2 after the bass, to get a kind of E major feeling as a framework for the chord, but the ensemble seems to choose the triad, since it is in root position, and is a part of the sound picture that is relatively easy to apprehend. These ways of constructing tonalities within a harmonic complex are fundamental to solving the vertical intonation challenges that the ensemble faces. Somehow the singers will have to make decisions about how the chord should sound, firstly in order to make a stable sound that makes it easier for the singers to produce the same result the next time they sing the chord, a predictable solution the vocal ensemble can produce again and again, and secondly to present a solution that meets the vertical intonation challenges in the best way to produce a stable harmony as close to the just intonation pitch system as is possible. 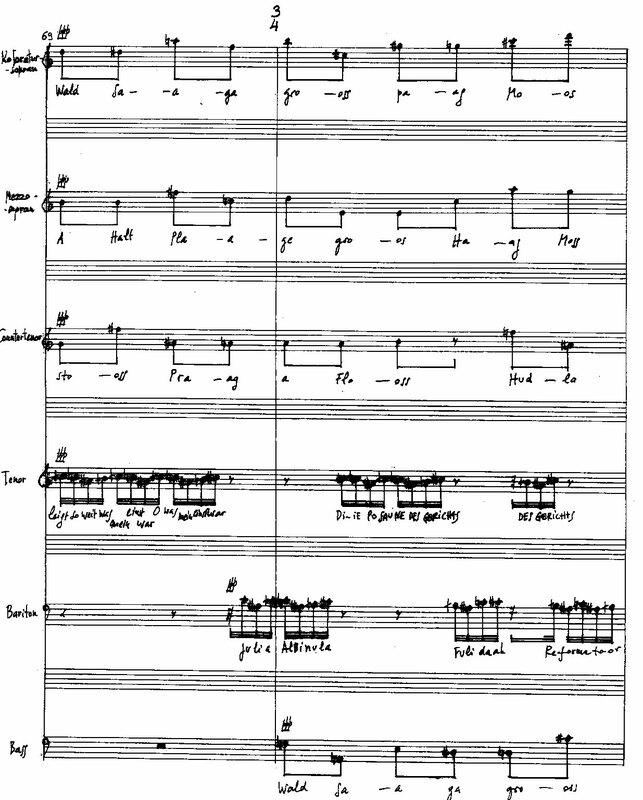 When the singers of the vocal ensemble read the score, they not only read their own part and determine how to sing it, but they also imagine their voice inside the whole ensemble, deciding how it relates to the others. This involves making decisions about the functions of their individual notes in the row of chords, as they try to discover what pitch system they should produce their pitches within. In Figure 3 the singer from Neue Vocalsolisten said that his part should be regarded as a part of a C sharp-major chord. In performance he will naturally pay more attention to these parts, directing his communication towards the singers who are a part of this chord. To reach a common musical goal, ensemble performance requires of the musicians that they coordinate their actions (Goebl and Palmer 2008: 427). Visual communication through gestures, eye contact, body sway, and so forth is important to this coordination, because it strengthens the musical message, giving viewers (whether it is the audience or another performer) knowledge about the performer’s intentions (427). Research on musical communication has mostly dealt with rhythmic synchronization, and how this impacts on how musicians move their body, use eye contact and other visual means. But considering how important intonation work is for a vocal ensemble, it is chord production, deciding which voices to sing together with and how one singer’s pitch relate to these other pitches, above all else, that has an influence on internal communication within the ensemble. Intonation work means finding not only the concrete pitch to produce within the sum of pitches produced by the other singers in the ensemble. It also means, as one of the singers in Neue Vocalsolisten said, finding the right formant quality, the right dynamics, and the right timbre. To match these demands, singers need both control and flexibility to move between the horizontal approach to intonation and the vertical one, by which latter means singers hear themselves within the overall harmonic context of the ensemble. The way of producing the voice is different if the singer defines him/herself within a soloistic modus or in a more accompanying modus. 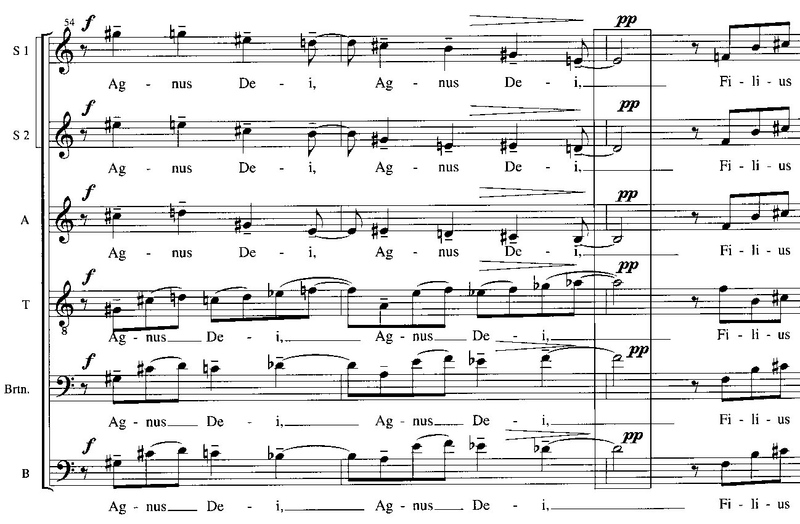 The timing, timbre, and vocal effects of the phrase (for instance the amount of air on the voice), and especially the amount of vibrato changes from one mode to the other, as one of the singers in Neue Vocalsolisten put it (see above). Vibrato is one of the elements of voice technique that is most often affected by intonation work. Discussions of when to apply or not to apply vibrato, and of whether the vibrato-less voice is healthy or not, have been around for a long time. Its use has an aesthetic aspect insofar as it is often associated with the music of the romantic era, while the vibrato-less voice has been associated with early music. Many classical vocal ensembles that specialize in early music exercise rigid vibrato control, sometimes producing tones with almost no vibrato at all. But the control of vibrato also has an intonation aspect. With vertical intonation, pitch production will usually accord with just tuning, wherein the interval between two tones gives a ratio of their frequencies in small integers (Hagerman and Sundberg 1980: 77). Vibrato corresponds to a small periodic variation of the fundamental frequency produced by the voice, and will eliminate the beating that results in slightly mistuned intervals (77). 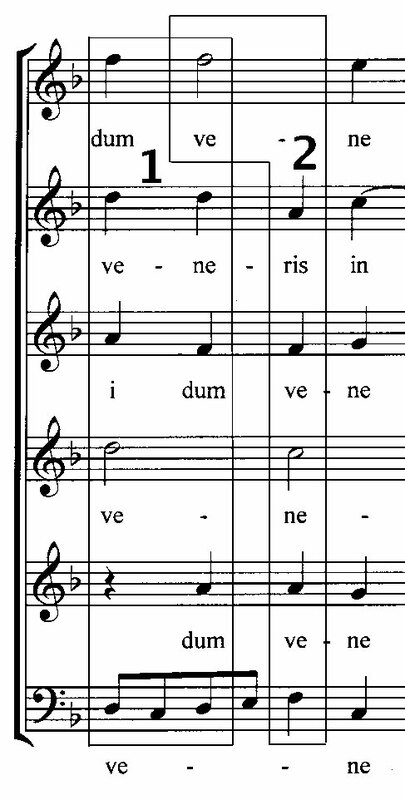 This beating is one of the elements that vocal ensemble singers listen to when trying to set just intervals. Therefore, being able to control vibrato, helps the singer produce exactly the pitch needed to eliminate beats, and thus contribute to a just interval or chord with the other singers. Historical writings show us that intonation work has been a target for singers at all times. Pitch production is a very complex task, involving a very intricate system of muscle control in the voice production system of the throat and in the respiratory system. The auditory system we use to control pitch does not give us a clear picture of how we sound, making it very difficult to find out whether what we produce is correct or not. All the members of a vocal ensemble face the same challenges, bringing intonation work right to the centre of the vocal ensemble’s attention. Throughout history singers have been dealing with various tuning systems in their attempt to deal with intonation challenges, and researchers and theorists have helped to find pitch systems and scales that would lead the way out of the pitch system jungle. There seems to be a clear line between the pitch systems a vocal ensemble uses when singing in a horizontal, melodic, more soloistic way, and when singing in a vertical mode as part of a harmony. The former horizontal mode is characterized by complex pitch systems that defy identifying anyone mode of intonation. On the other hand, when in vertical intonation mode, singers define their pitches much more in terms of just intonation. This urge is so strong that even within complex, non-tonal music they construct local tonal structures to help stabilize their pitch production. The processes involved in producing the desired pitches are quite complex, and the voice is not always the most accurate intonation instrument. The singers of Neue Vocalsolisten Stuttgart and other ensembles seek a way to produce predictability within this rather unpredictable world, and do so by giving horizontal/melodic intonation more freedom, and by locking vertical intonation into more clearly defined systems. In this way they reduce the luck dimension involved in pitch production, and provide a stable result they can produce over and over again. 1. ↑ The title is from the book Tuning and Temperament — A historical survey (1957/2004) by J. Murray Barbour. 2. ↑ I am grateful to my colleague Christina Kobb for helpful comments in the preparation of this article. 3. ↑ The title is from the book Tuning and Temperament — A historical survey (1957/2004) by J. Murray Barbour. 4. ↑ This resulted even in new suggestions about how to build keyboards; keyboards with split keys persisted for a long time. 5. ↑ This theory was put forward by Lerdahl (2001). 6. ↑ Combination tones: two tones sounding simultaneously may give rise to the sensation of one or more additional tones (Plomp 1976). In this example the two singers of Neue Vocalsolisten sang a1 (440 MHz) and c#2 (550 MHz), giving rise to the tone A (110 MHz) when hitting the frequency purely intonated.